Ahead of September’s Global Youth Economic Opportunities Summit, Adam Leach offers reflections and a reminder of the 2017 Summit hosted by Making Cents International. The call to action at the last Global Youth Economic Opportunities Summit was “connect, exchange, impact”, to highlight the importance of cross-sector collaboration and to promote closer alignment in supply of and demand for youth employment. Youth unemployment and underemployment are huge, and growing, challenges in the developing world. ILO estimates that 71 million young people were unemployed in 2016 with 37% of working youth living in poverty. The problem is not the absence of jobs but the mismatch between market demand for labour and the supply of skills. Equipping young people with market-ready skills and utilising private sector capacity to manage the skills-jobs gap for a younger generation is the crucial equation for which donors, private sector, civil society – and young people themselves ­– need to find solutions. Youth employment is a major 21st Century challenge and the consequences of youth un- and underemployment are a key element in the growing inequality crisis. The rapidly changing context of work is fueled by the digital automation of all economies which is shaping a new social contract. There are opportunities for many but for vulnerable young people aged 15-29 the future is especially uncertain. Their need for jobs and decent work, as well as the market’s search for talent, depends on delivering the ‘bundle’ of talent and skills, access to assets and resources, networks and the connections between them. The contribution that youth makes economically, their resilience to shocks and their role in building institutions, are becoming increasingly evident especially in a world of mobile populations. In adjusting to changing conditions and to secure inclusive growth, policy makers and implementers on the ground can focus effective and appropriately designed assistance on helping young people to transform their own lives out of poverty and vulnerability. Globally, digital automation – involving the nature, scale and pace of change in digital and information technology (DT) – presents major opportunities and challenges for human capital development and employment. Between entropy and creativity, DT is creating work through new activities and reflecting changing patterns of work. The actual degree of substitution of digital for human capital depends on who has access to the opportunity created. ‘Crowd-based capitalism’, a ‘gig economy’ or a ‘sharing economy’ maybe replacing managerial capitalism with hypotheses about the ‘end of employment’. Platforms such as Uber, Lyft, and Airbnb are replacing conventional forms of incorporation. Located between market and institutions, these formations are identified by new patterns of trust, and structural capital is intellectual property and know-how. In the search for talent, ideas, finance, and technological advance these formations are challenging the current social contract with threats to stability for workers. They are also forcing re-thinking in education that prepares workers for enterprise and transition over their working lifetime. Preparing young people to signal to the market the talent they offer requires private sector help to increase youth resilience, recognition of soft skills and adaptability (e.g. through certification) and portable identities (through digital records), and planning of career pathways for acquisition of relevant skills. Learning from the features of digital disruption (i.e. that it is rapid, low-cost and iterative) in the search for ideas and ambition to fulfil what people want and are able to do, young people can help to design, develop, and deliver innovative ideas with social as well as economic utility (so-called, ‘human-centred design’). Operating in the ‘gig economy’ and responding to the demand for constant iteration and testing (not production to fixed end points) depends on life skills (confidence, initiative/leadership, negotiation), supportive networks (hubs, mentoring) and changing the policy context and responsiveness to new modes of work. In the informal sector in Africa, which has no formal jobs and 80% of the labour force, and accounts for some 55% of continental GDP (African Development Bank, 2013), informal connections and chance typify the conditions for non-salaried workers in mainly urban labour markets. Existing trends mean that there will be growing numbers of unprotected and unsupported unemployed young people. DT solutions can help to provide access, skills, and marketable assets removing anonymity and caprice. For example, Lynk is a tech-based platform in Kenya, enabled by Mercy Corps’ Social Ventures Fund, seeking to revolutionize this sector by connecting youth to “gig” jobs in over 100 categories. Real economic opportunity for young people, especially the most vulnerable, demands not only effective youth employment programmes but also understanding, analysis and data for the informal-formal continuum. Comparative research in Bangladesh illustrates the importance of distinguishing degrees of informality, exploitation and control. For the self-employed, terms are broadly similar but returns are slightly better and stability of productive activity is greater. es access to higher education and certification, matching young people to private sector requirements and making them ready for work through literacy, attitudinal and behavioural development, and providing them with technical and cognitive skills. An analysis of what works for youth employment in low-income countries notes that in Africa, with more than 50% of young people in rural areas and small towns, the most effective opportunity pathways for them (and for household enterprise start-up interventions) include a combination of skills and assets, and that training (especially in life skills) combined with cash delivers social protection and economic improvement. This signals important challenges to dominant logic about scale impact: it is more important to concentrate on scalability through least-cost, good quality interventions that can be scaled up than on large-scale interventions per se. This is important in marshalling sufficient effort to tackle problems relating to youth economic opportunity, especially for the most marginal. Employment opportunity for the most marginal demands more imaginative, refreshed thinking about the nature of employment, engagement and enterprise. Integrating young people into agriculture, for example, demands intentional inclusion in the appropriate stages of the project cycle, encouragement to be part of decision-making as active citizens and partners, not beneficiaries, and application of innovation and technology to do things better. USAID’s ‘Positive Youth Development’ policy provides a powerful framework for investing in youth and measuring impact. It recognises that ‘youth participation is vital to development’ whilst noting ‘important variations in the needs and vulnerabilities of adolescents according to age, gender, and developmental stage, as well as cultural, socio-economic and environmental factors’. This might contribute to a better quality of results to include not only deliverable outcomes but also real gains to young people, increases in institutional capacity, and trust (or, the celebration of the marginal utility to growth arising from the effective integration of young people into productive livelihoods) and therefore higher adoption of such a results framework. 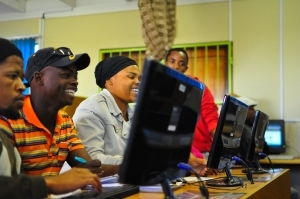 The vital importance of data and demonstrable results is also true of the search for employment opportunities and solutions for youth on the move. A valuable baseline report on youth employment globally is the 2017 S4YE report. Mass mobility and migration (voluntary and involuntary) fuelled by structural labour shortages in wealthier countries, political instability and violence, and climatic volatility will affect young people disproportionally and must command greater attention in policy and practice. The S4YE report is also an important contribution to several discourses including ‘leaving no one behind’, ‘humanitarian futures’ and ‘private sector engagement’. All of these share a crucial precondition: effective youth employment programmes, especially for the most vulnerable young people, will need to be locally delivered, coherent and coordinated, and adaptive to both civic and economic imperatives. Summit references to the ‘fourth industrial revolution’, ‘gig economy’, and ‘technology opportunity’, suggest some key points may help to steer private sector engagement and change policy and practice for collaboration, learning and results. Agency of young people is vital. Technology offers skills at scale – but only to some with IT access. Potential for employment requires credentials and economic identity. Employment opportunity depends on life (soft) skills but also depends on demand and employer suasion. Partnership demands trust, security and relationships between youth and employers. Soft, or life, skills are a major theme at the Summit every year; for a useful summary of key issues surrounding soft skills see MasterCard Foundation, What Works in Soft Skills Development for Youth Employment? See information on a Making Cents project on Youth Engagement in Agriculture.